Raw Conversion. Shadow Highlights Adjustment layer. Global Midtone Contrast. Hue/Saturation. Unsharp Mask. Resize and save for web. The blue in this is stunning... Nice work. I can't get enough of this photo. It is just so compelling and enchanting. I never tire of looking at it. Truly spectacular. I would not change a thing. The sense of anticipation and peering in is incredible. Degas would love it. Thanks for the comments on the lines and crows. PS. Just added you to my favorites. So lovely. I'm surprised I didn't comment during the challenge, but 276 is a daunting number. Really beautiful and the hands of the ballerina in the center, really makes the shot for me. It epitomizes the elegance and poise of the dancer, not only with her legs and feet, but arms, hands and entire body. Congrats on top 10.
edit is excellent - beautiful performance subject - perfect silhouette low key approach... a first-class foto. Wow!!! What a stunning image! I am so glad it finished so strong! Congratulations on a top 10 placing! I would have loved to see this one with a ribbon!!! Woah, this is just enchanting. Fabulous. My choice for the ribbon. A fun image and very well captured to imaprt its flavor. Congratulations on your top 10 finish. Awesome picture ... congrats on your top 10. Congrats on the top 10 finish, especially with a color image. Whiting Seventh place. Lucky to have such a great mentor. amazing photo whiting, 7 out of 277. The ballerina really stands out as the subject in the middle from that white light circling her. It really is low key. Once again, nice shot. Mr. whiting you are the sh*t your pictures are owning a 6.6 and a 5.9 you are a pro. Dear God, you own. I am jealous my water picture is at a 5.1 which is good for me. good effort and nice job done. Nice idea, nice color, composition, clean silhouettes. Might be better to crop out right edge, but I think that it is wonderful regardless. Beautiful image that captures backstage anticipation. Excellent use of background light. AWESOME!!! Way cool on so many levels....congrats. 10 from me. Captivating image. Wondering if the blue background extended all the way to the right of the frame whether the effect might have been greater. Well done. I keep returning to this one, the blue is great, nice work. This is my over-all favorite in this challenge. 10! Really like the silhouette - works wonderfully. Wondering if maybe the left and right sides were cropped if it would be a more powerful image. 7 good luck in the challenge! 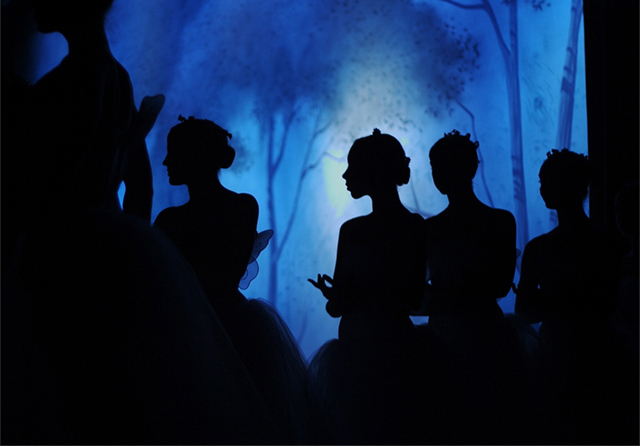 These silhouettes are absolutely wonderful. The two profile faces make the image - great capture of the moment. Proudly hosted by Sargasso Networks. Current Server Time: 04/23/2019 05:53:30 PM EDT.